I have 2 blog posts today so make sure to check below for the other posting. I came across The Pink Elephant on a blog recently and bookmarked it because it was a new blog starting up. I can tell these ladies are going to have some fun things in for us. Here is my card for the second challenge which is using glitter on your card! The card base is Basic Black with Pixie Pink matted on top. The designer paper is from the Black Market Paper Society called Ebony & Alabaster 6X6 pack I found that at Gina K's website too. The paper is textured and is so pretty in person. 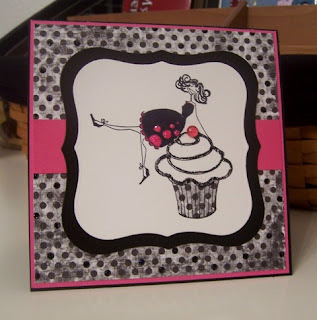 I used Cupcakeabella from Stamping Bella I stamped her in Staz On black ink onto Gina K's Pure Luxury 120 lb. white cardstock. Man oh man is that the thickest cardstock I've ever come across. It stamps wonderfully and you can watercolor and use blender pens on it with ease. I used the Labels One by Spellbinders to mat her on. I paper pieced the same dp onto the cupcake liner. I used star dust stickles on the pink dots on her dress, and black diamond stickles to outline the cupcake's frosting and then on various dots on the designer paper. I can't wait to see more challenges by The Pink Elephant! adorable card, love the frosting. I love pink and black together!! It always looks so nice! Great job! This is fabulous - I love the image. Great fun. Thanks for joining the challenge at the Pink Elephant - it's great to see such good work. wow how fun! Love the polka dots! Yay! Lori and her team at TPE ROCK! :D Their challenge this week is so much fun and you've done it serious justice Felicia! I love cupcakeabella, she is probably one of my all time faves. The b/w/pink is adorbale - great job! Oh my heck, what a stinkin cute card! I love teh poak-dots and love that you used the same paper on teh cupcake wrapper! Cute Cute Cute! Your card is too cute!! I love this!! What a cute card, love everything about it! Felicia, I absolutely loved your cards. I need to get some stamps from Stamping Bella. I've been eyeing that site for awhile. Gorgeous! I didn't make Marissa's cake, I get all the cakes from this incredible bakery near me. I have Adobe 7 Photoshop. If hubby's able to help that would be awesome and appreciated. Have a great day! so cute. pink and black is my favorite combo! This card is FAB!!! love the black and pink look. so chic! Ooooooh I love those colours together and what a cute image. Great card! What a fabulous card! I love the colors! Very cute - awesome color combination! I love this - the Bella on top of the cupcake is adorable. Wonderful job on this challenge. So beautifully done!! Love it in these colors. Great card Felicia! I love the colors! Felicia...as always, your card looks wonderful! Great card. I'll have to visit that site to get some inspiration. This is SO ultra cool! I love this! I make to CASE it!